Friendship Container Manufacturers Limited is establishing a metal and plastic packaging plant at Tatu City, becoming the latest company to expand to the fast-growing Special Economic Zone near Nairobi. The construction of Friendship’s warehouse and office block is underway and will cover an area of 15,000 square metres at the Tatu Industrial Park, with completion and occupancy planned by the end of 2017. Friendship’s CEO, Arun Shah, said the strategic move to Tatu Industrial Park will drive the business objectives of the company while positively influencing the social and economic landscape of Kenya. “Friendship’s selection of Tatu Industrial Park underpins our company’s growth and expansion agenda. 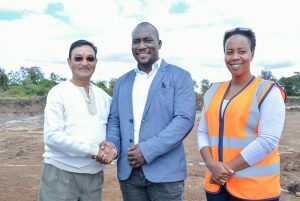 Not only will Friendship thrive in the business-friendly environment of Tatu Industrial Park that is free from the congestion we experience in Nairobi, we will provide job opportunities to additional people in the area apart from the 250 exisiting employees that will relocate to Ruiru,” Shah said. Tatu City Senior Development Manager Chris Ochieng said Friendship’s decision to move to Tatu Industrial Park is another sign of investor confidence in the wider Tatu City development, where the first school has opened and large-scale residential projects are under construction. The multi-million shilling investment by Friendship follows announcements by other companies building facilities at Tatu Industrial Park, including Chandaria Industries, Africa Logsitics Properties, Dormans, Unilever, Kim-Fay and Maxam. Tatu Industrial Park comprises of 457 acres of serviced land suitable for non-polluting light industrial, assembly and warehouse and logistic uses.